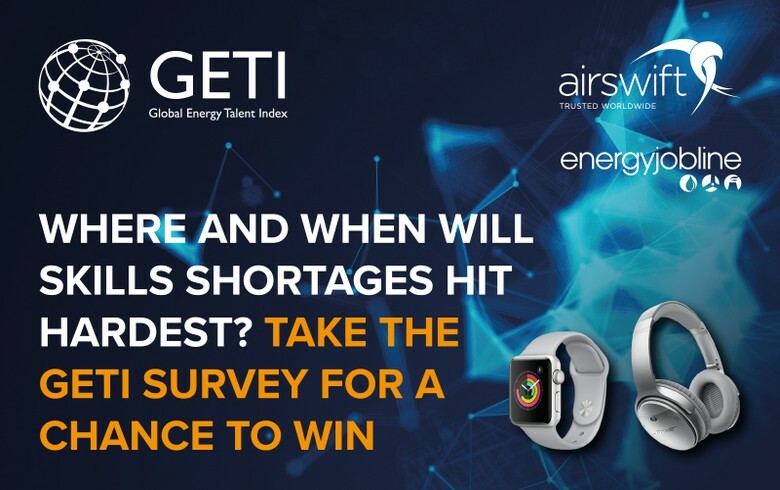 Energy Jobline and Airswift are inviting you to become part of the 2019 Global Energy Talent Index survey. The GETI report highlights the impact of skills shortages, different industry perceptions across the age groups, salary benchmarks and future job hot spots. Survey respondents will also have the opportunity to win a free Apple Watch or pair of BOSE Headphones. This year’s report will seek to uncover trends in demographics, pay and sector mobility. The resulting index will be a “deep dive” into the varied wants and needs of workers in each energy sector. Building on findings from previous years, the survey will look closely at the issue of skills shortages within each sector and elicit the professional opinion of where these shortages will occur and what can be done. The survey results will be reported in the Global Energy Talent Index in January 2019.